Milling vises There are 21 products. Useful clamp for various welding projects. Opening of the jaws 100mm. Jaw width 315 mm. Jaw piece length 125 mm. Jaw height 60 mm. Weight 12 kg. Longitudinal movement 150 mm / vertical movement 100 mm. The clamping kit to buy with a milling machine. 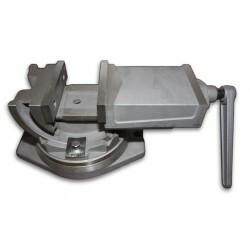 Machine vise, jaw opening 110 mm. Machine Vise. Dimensions (from the stand) 312 x 200 x 75 mm. Opening of the jaws 160 mm. The jaw width 140 mm. Jaws 40 mm. Weight 11 kg. Machine Vise. Dimensions (from the stand) 375 x 230 x 85 mm.Opening of the jaws 150 mm.The jaw width 140 mm. Jaws 45 mm. Weight 17 kg. Big machine vise, jaw opening 212 mm. Weight 37 kg. Tilting machine vise, jaw opening 120 mm. Machine vise, jaw opening 126 mm.